Glue guns are used around the world by people of all ages for a myriad of tasks. Crafting, school projects, floral arrangements, household repairs, and so much more, have been held together for years—quite literally—by hot glue guns. However, not all hot glue guns are created equal. 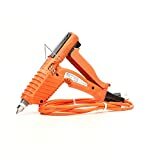 If you are in the market for your first hot glue gun or are looking to upgrade, this buying guide will detail everything you need to know about the best glue guns on the market. Standard: Standard glue guns are the most commonly sized glue guns that most of us are familiar with. Mini: Mini glue guns are around half the size of the standard, full-size glue guns. Due to their reduced size they also require smaller glue sticks than standard guns do. 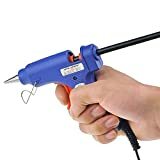 Multi-Temperature: Some glue guns come with adjustable temperature settings. Some simply have “high” and “low” while others heat up along an adjustable spectrum. Cordless: Cordless glue guns come in two forms. The first type heats up on its charging stand, is removed for use, and then is replaced to heat back up between glue applications. The second type is battery powered and must be recharged from time to time. Controlled Glue Distribution: Happy consumers could not stress enough how thrilled they were to be able to dispense exactly how much glue they wanted. Reviewers noted their frustration with past glue guns, citing issues with even distribution, sudden bubbles, stringy after-glue, and thick glue lines that could not be adjusted. 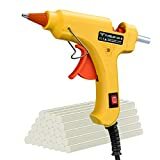 The top-rated glue guns had thin tapered ends and responsive triggers that gave users the power to apply the perfect amount of glue to achieve superior results. Rapid Heating: Many five star reviews raved about quick heat-up time. 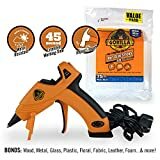 A common sentiment was that glue guns are often needed for quick fixes and it can be highly frustrating to wait triple the actual use time just for the glue to heat up properly. Mess-Free: Another huge plus about the best-reviewed glue guns was how mess-free and fuss-free they were. 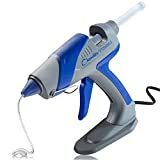 Many users had experienced glue guns that constantly dripped during down time and left sticky little strings all over their workspace and project. 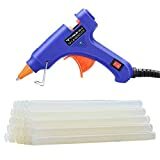 The highest preforming glue guns had minimal to no dripping at all. Lightweight: For customers who use their glue guns all the time, a heavy product can be tiresome. 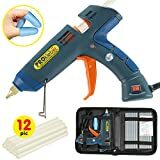 The majority of positive reviews on the most popular glue guns noted the pleasantly lightweight quality of their new glue guns. This can be especially important for maintaining glue gun balance when trying to maximize control and precision. 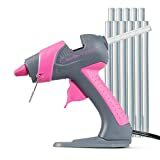 Project: If you work with a variety of materials, it wise to purchase a glue gun that offers multiple heat settings. Many materials, like foam, melt easily and can be better managed by glue that is not quite so hot. Additionally, if you have an extremely high heat setting available, you will have more time to make adjustments once your glue is applied as it will take longer for the glue to harden and cool. Time in use: When using a glue gun for long periods at a time, you must consider whether or not an auto-shutoff option is right for you. Some people prefer this as they are prone to forgetting to unplug their gun. Additionally, some glue guns handle prolong heat better than others. 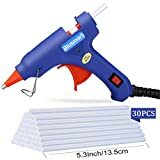 Read up on reviews and product specifications to get a feel for which glue gun will handle your usage patterns best. 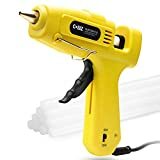 Ease of Movement: If you desire portability or the freedom to move around while you work, a cordless glue gun or one with a long cord is necessary for you. Additionally, take into account how lightweight each gun is. A heavy or poorly balanced gun can make it difficult to achieve satisfactory results. Precision: Many projects require extremely precise, delicate amounts of glue. A poorly manufactured glue gun can spoil your work if it releases sudden bubbles of glue, leaves webby strings behind, or dispenses overly thick streams. 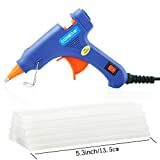 Look for glue guns that come with narrow, tapered tips for thin lines of glue and have removable stands for tight spaces. PAM Fastening Technology: Pam Fastening was founded in 1982 and has since become an international leader in the development and manufacturing of adhesive products. They distribute products for the building industry as well as adhesive products for framing and furniture. Surebonder: Surebonder is a family-owned business that prides itself in providing customers with exactly what they want by customizing products that are both high quality and competitively priced. 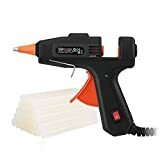 They distribute a wide range of adhesive products from glue guns to glue skillets, as well as any staple or nail tool you can imagine. Adhesive Technologies: Adhesive Technologies was founded over thirty years ago by an inventor and chemical engineer whose mission was to produce the most cutting-edge and highest quality glue guns and its accessories on the market. They have since become the world leader in hot melt adhesives and glue guns. In addition, they are the only company that both designs and engineers its glue guns. Stanley: Stanley was founded over 170 years ago as a company for DIY-loving people looking for innovating and high-quality products. They have a strong reputation for excellence and strive to continue producing products to help build, repair, and protect the world.